An eternally grumpy character made famous by Welsh actor Windsor Davies is being used to inspire ex-servicemen who are struggling. Graffiti depicting Sergeant Major Williams from 1970s comedy It Ain't Half Hot Mum has appeared on a wall in Melbourne's street art district. Davies, who also starred in rugby film Grand Slam, died in January, aged 88. 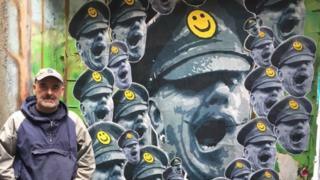 Street artist Sean Burton created the Sgt Major Happy work to encourage ex-servicemen to confront their problems. He served in the British and Australian armies and after retiring on medical grounds, has been painting for ten years to maintain his health and well-being. "A lot of my art work has military themes running through it, sharing the highs and lows of service life," he said. "The message behind the Sgt Major Happy work is despite the hard times, keep smiling and keep on keeping on." Mr Burton grew up in London in the 1970s, when military-themed comedies such as Dad's Army and It Ain't Half Hot Mum were primetime viewing. He added: "For me, Windsor Davies' Sgt Major was an iconic British military character. "Despite him constantly being exasperated and angry, he made us laugh, hence the smiley face cap badge in my art work. "I've had many expats and tourists here instantly recognise him in my work and laugh when they recall his Sgt Major character." Davies was born in Canning Town, London but returned to his father's home village, Nantymoel in Bridgend county, when World War Two broke out. After teaching for four years, he got involved in acting. "As an ex-serviceman, himself, I hope it's a fitting 'tribute' of sorts to Windsor Davies, that he still makes people laugh," Mr Burton said. It took him three hours to put it together using aerosol paint, stencils and stickers, and it is in ACDC Lane in an area near Hosier Lane, which is renowned for its graffiti art. While he is unsure how long it will remain there, Mr Burton used one of Windsor Davies' best-known phrases to sound a philosophical note about its future. "It will probably be painted over by the time you read this, such is the ephemeral nature of street art," he said. "Here today and gone tomorrow - oh dear, how sad, never mind."